Systemic administration of rIL-18 protein to mice significantly suppresses the growth of murine tumor cell lines. The antitumor effect of IL-18 appears to be primarily mediated by asialo GM1+ cells. Since IL-18 enhances Fas ligand (FasL) expression on NK cell lines, the IL-18 antitumor effects could be mediated by FasL-induced cross-linking of Fas and subsequent tumor apoptosis. To address this question, rIL-18 or rIL-12 was administered to animals bearing the CL8-1 melanoma inoculated intradermally into wild type (wt), lymphoproliferation gene (lpr) (Fas deficient), or generalized lymphoproliferative disease gene (gld) (FasL deficient) mice. Although rIL-12 treatment retained significant antitumor effects in gld and lpr mice, those of rIL-18 administration were completely abrogated in gld but not lpr or wt mice. In vitro cytotoxicity was significantly enhanced against NK-sensitive YAC-1 cells and CL8-1 cells by rIL-18 administration to wt mice, but not to gld mice. Furthermore, rIL-18 administration augmented the cytotoxicity of liver lymphocytes harvested from perforin-deficient mice, whereas rIL-12 administration did not. Consistent with the role of this pathway, rIL-18 administration also up-regulates the expression of FasL mRNA in splenocytes. Lysis of CL8-1 cells induced by anti-Fas agonistic Ab was enhanced about 1.4-fold by IFN-γ, a cytokine that is induced by IL-18 in vitro and in vivo. We conclude that the antitumor effect of IL-18 is exerted predominantly through a Fas-dependent pathway. The perforin pathway, however, appears to be the predominant cytolytic pathway mediating IL-12 antitumor effects. Interleukin-18 is an IL-1-like cytokine that was first identified as an IFN-γ-inducing factor (IGIF) based on its ability to induce high level IFN-γ secretion by both NK and T cells (1, 2). IL-18 mediates other important functions, including enhancement of NK cell activity and stimulation of proliferation of activated T cells (1, 2, 3, 4, 5). Recent reports have suggested that IL-18 affects the development of cellular immunity (Th1 response) following Ag presentation (6). It also potentiates IL-12-driven Th1 development in BALB/c mice and, with IL-12, promotes IFN-γ production from Th1 cells in a synergistic fashion. Unlike IL-12, IL-18 alone does not drive Th1 development in BALB/c or C57BL/6 mice. Studies of IL-18-deficient mice support the notion that IL-18 does play an important supportive role in Th1 development (7). IL-18-deficient mice have normal IL-12 induction but markedly reduced IFN-γ production following LPS stimulation subsequent to Propionibacterium acnes priming. Significantly impaired NK cell activity and reduced Th1 cell response after injection of P. acnes or Mycobacterium bovis are also noted in these mice. In mice lacking both IL-18 and IL-12 production, markedly impaired NK activity and Th1 responses are noted. Th1 response could be reconstituted by IL-12 administration but not in IL-18-treated animals. In addition to these functions, IL-18 also enhances expression of Fas ligand (FasL)4 on NK (8) and Th1 clones (9) in mice and on myelomonocytic cells in humans (10). We and others have shown that rIL-18 has significant antitumor effects in multiple murine tumor models (11, 12). In addition, we have also shown that IL-18 could be utilized as a cancer gene therapy, especially when combined with systemic administration of IL-12 (13). Interestingly, the antitumor effects of systemic rIL-18 administration were retained, although diminished, in IFN-γ or IL-12 gene-disrupted animals and were completely abrogated by administration of anti-asialo GM1 Abs (12). These results suggested that rIL-18 antitumor effects were mediated primarily by asialo GM1+ cells in an IFN-γ-independent fashion. Cytotoxicity of NK cells against tumor appears to be mediated by apoptosis induced by delivery of perforin/granzyme or Fas cross-inking by FasL (14). IL-12 enhances the cytolytic activity of NK-like cells primarily by inducing expression of perforin (15, 16). Thus, it was of interest to determine how NK cells mediate IL-18-induced antitumor effects. We hypothesized that IL-18 antitumor effects were mediated by Fas-FasL-induced apoptosis of tumor cells since IL-18 has been reported to enhance FasL expression on NK cell lines (8). We examined the IL-18-mediated antitumor effects on growth of subcutaneous tumor in generalized lymphoproliferative disease gene (gld) (FasL-deficient), lymphoproliferation gene (lpr) (Fas-deficient), and perforin gene-disrupted animals in vivo and in vitro. We demonstrate here that the antitumor effects of rIL-18 are completely absent in gld mice whereas IL-12 antitumor activity is retained in both gld and lpr mice. In addition, rIL-18 stimulates the cytolytic activity of lymphocytes from wt mice, but not gld mice. These results demonstrate that Fas-mediated tumor apoptosis plays a critical role in the antitumor effects mediated by rIL-18 but not that of rIL-12. Thus, the major role of IL-18 is to modulate innate effector immune mechanisms that subsequently enhance the induction of the specific adaptive antitumor immune response. Murine rIL-18 was kindly supplied by Hayashibara Biochemical Laboratories (Okayama, Japan). Murine rIL-12 was a gift from Genetics Institute (Cambridge, MA). Murine rIFN-γ was purchased from PharMingen (San Diego, CA). CL8-1 is a murine melanoma cell line derived from C57BL/6 mice and was generously provided by Dr. Gorelik (University of Pittsburgh, Pittsburgh, PA). This cell line was maintained as described previously (17) and was demonstrated to be free of mycoplasma contamination periodically. Wild type (wt) C57BL/6 mice were purchased from Taconic Farms (Germantown, NY). The gld (FasL-deficient), lpr (Fas-deficient), perforin −/−, and scid/scid C57BL/6 mouse strains were purchased from The Jackson Laboratory (Bar Harbor, ME). These animals were maintained in the animal facility at the Center for Biotechnology and Bioengineering, University of Pittsburgh, and were used for experiments when they were 7 to 10 wk old. All the animals were randomized and ear tagged before the experiments. Experiments were performed in a blinded fashion. CL8-1 cells (1 × 106) were inoculated intradermally (i.d.) in the flank of mice on day 0 in groups of five animals. Mice received once daily i.p. injections of rIL-18, rIL-12, or HBSS (Life Technologies, Grand Island, NY) on days 0 to 7. Tumor size was measured every 2 to 4 days, and the tumor volume was calculated using the formula 0.5 × A × B2 (A=largest diameter; B=smallest diameter). Each experiment was confirmed in at least one other experiment, and the results of a representative experiment are shown. Under deep ether anesthesia, mice were euthanized by exsanguination through the subclavian artery and vein. In addition to blood, the liver and spleen were harvested. The spleen was pressed through sterile gauze and washed, and the cell pellet was treated with RBC lysis solution (0.83% NH4Cl) and rinsed twice. Hepatic mononuclear cells (MNCs) were prepared essentially as described by Goossens et al. (18). In brief, the liver was passed through stainless steel mesh, and MNCs were rinsed twice and were resuspended in 32% Percoll containing 100 U/ml heparin. Following centrifugation at 2000 rpm for 10 min at room temperature, the pellet was resuspended in RBC lysis solution and then rinsed twice in 5% FCS-HBSS. YAC-1 (lymphoma cells of A/S [H-2a] origin), CL8-1, and L5178Y (T cell lymphoma derived from DBA/2 mice [H-2d]) were used as target cells. Target cells were propagated in culture, labeled with 100 μCi Na2(51Cr)O4 for 60 min at 37°C in RPMI 1640 medium containing 10% FCS, washed three times with medium, and placed in cytotoxicity assays. Labeled targets (103/well) were incubated in a total volume of 200 μl with effector cells in 10% FCS RPMI 1640 in 96-well round bottom microtiter plates. The plates were centrifuged before incubation, and, after 4h of incubation, the supernatant was harvested and measured in a gamma counter. The cytotoxicity was calculated as the percentage of releasable counts after subtraction of spontaneous. The spontaneous release was less than 15% of the maximum release. Mice were treated with 1 μg of IL-18 for 2 days; after being sacrificed, the splenocytes were harvested. Total cellular RNA was extracted from whole MNCs using RNAzolB (Tel-Test, Friendswood, TX). Four micrograms of total RNA was reverse transcribed using an RNase H-reverse transcriptase (Superscript; Life Technologies). Two hundred nanograms of RNA-equivalent cDNA was used as a template for PCR. Amplification for FasL and β-actin was performed 22 cycles consisting of 94°C for 1 min for denaturing, 57°C for 1 min for annealing, and 74°C for 1 min for extension. The sequences of primers for FasL (19) and β-actin are as follows: FasL, 5′-CTA CCA CCG CCA TCA CAA C-3′ and 5′-CCT CTT CTC CTC CAT TAG CAC-3′; β-actin, 5′-TTCTACAATGAGCTGCGTGTG-3′ and 5′-CACTGTGTTGGCATAGAGGTC-3′. Amplified products were electrophoresed on a 1.8% agarose gel and visualized with ethidium bromide staining. To determine whether the Fas Ag expressed on CL8-1 cells is functional, 1 × 106 CL8-1 cells were seeded in 12-well plates and incubated for 30 h at 37°C with an agonistic Ab (Jo2; PharMingen; 1 μg/ml) against the Fas Ag with or without IFN-γ (50 ng/ml). The percentage of dead cells was determined by flow cytometer after propidium iodide (PI) staining. Nonparametric Wilcoxon test was used in the statistical analysis of the size of tumor. Student’s t test accompanied with F test was used in the statistical analysis of the in vitro cytotoxicity assay. The difference was considered statistically significant when the p value was less than 0.05. We have previously reported that administration of rIL-18 significantly suppresses the growth of CL8-1 murine melanoma cells. Recently, IL-18 has been shown to enhance FasL expression on NK cells (8). To examine the role of Fas-FasL-mediated apoptosis in this model, 1 × 106 CL8-1 cells were inoculated i.d. on day 0 in C57BL/6 wt, lpr, or gld mice, and 1 μg of rIL-18 was injected i.p. daily for 7 days from day 0. Although rIL-18 administration significantly suppressed the growth of CL8-1 cells in C57BL/6 wt and lpr mice (wt/HBSS vs wt/IL-18, on day 15 through day 30, p < 0.05; lpr/HBSS vs lpr/IL-18, on day 6 through day 21, p < 0.05), antitumor effects of rIL-18 were absent in gld mice (gld/HBSS vs gld/IL-18, on day 21, p = 0.36; wt/IL-18 vs gld/IL-18, on day 9 through day 30, p < 0.05) (Fig. 1⇓A). In contrast, IL-12 administration greatly suppressed the growth of CL8-1 cells even in gld mice (gld/HBSS vs gld/IL-12, on day 9 through day 30, p < 0.05; wt/IL-12 vs gld/IL-12, on day 30, p = 0.77) (Fig. 1⇓B). These results strongly suggest that the antitumor effects of rIL-18, but not rIL-12, administration are primarily mediated by the Fas-FasL pathway. In vivo antitumor effects of IL-18 were abrogated in FasL-deficient gld mice. Groups of five animals were inoculated i.d. with 1 × 106 of murine melanoma CL8-1 cells on day 0 in C57BL/6 wt, lpr (Fas-deficient), and gld (FasL-deficient) mice. A, Mice received daily i.p. injections of either HBSS or 1 μg of IL-18 for 7 days from day 0. Tumor size was measured every 2 to 4 days, and the tumor volume was calculated using the formula 0.5 × A × B2 (A=largest diameter; B=smallest diameter). Bars represent mean ± SD. There is statistical significance (p < 0.05) as follows: wt/HBSS vs wt/IL-18 (on day 15 through day 30), lpr/HBSS vs lpr/IL-18 (on day 6 through day 21), and gld/IL-18 vs wt/IL-18 (on day 9 through day 30). There is no statistically significant difference between wt/HBSS and lpr/HBSS (on day 3 through day 21, p > 0.07) or wt/HBSS and gld/HBSS (on day 3 through day 21, p > 0.05). B, Mice received daily i.p. injections of either HBSS or 0.08 μg of IL-12 for 7 days from day 0. Tumor size was measured every 2 to 4 days, and the tumor volume was calculated using the formula 0.5 × A × B2 (A=largest diameter; B=smallest diameter). Bars represent mean ± SD. There is statistical significance (p < 0.05) as follows: wt/HBSS vs wt/IL-12 (on day 22 through day 30), lpr/HBSS vs lpr/IL-12 (on day 22 through day 30), and gld/HBSS vs gld/IL-12 (on day 19 through day 30). There is no statistically significant difference between wt/HBSS and lpr/HBSS (on day 3 through day 30, p > 0.098), wt/IL-12 and gld/IL-12 (on day 3 through day 30, p > 0.53), or wt/HBSS and gld/HBSS (on day 3 through day 30, p > 0.05). To examine whether the Fas-FasL pathway is responsible for the in vitro cytotoxic activity induced by in vivo administration of rIL-18, we examined the cytotoxicity of splenic and hepatic MNCs harvested from C57BL/6 wt and gld mice after rIL-18 administration against YAC-1 (NK-sensitive) and CL8-1 target cells. 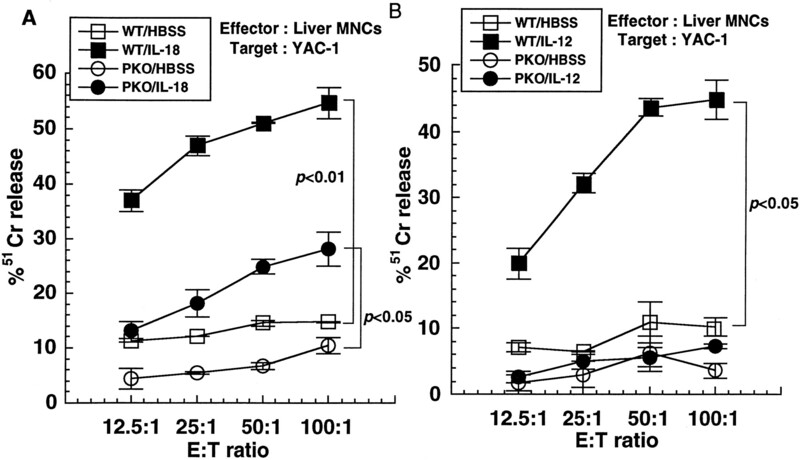 The rIL-18 administration greatly augmented the in vitro cytotoxic activities of splenic (wt/HBSS vs wt/IL-18, p < 0.05 (all points)) and hepatic (wt/HBSS vs wt/IL-18, p < 0.01 (all points)) MNCs against YAC-1 cells in wt, but the augmentation was significantly reduced in gld mice (wt/IL-18 vs gld/IL-18, p < 0.05 (all points) in both splenic and hepatic MNCs) (Fig. 2⇓A). Similar results were identified when CL8-1 cells were used as target cells (Fig. 2⇓B). 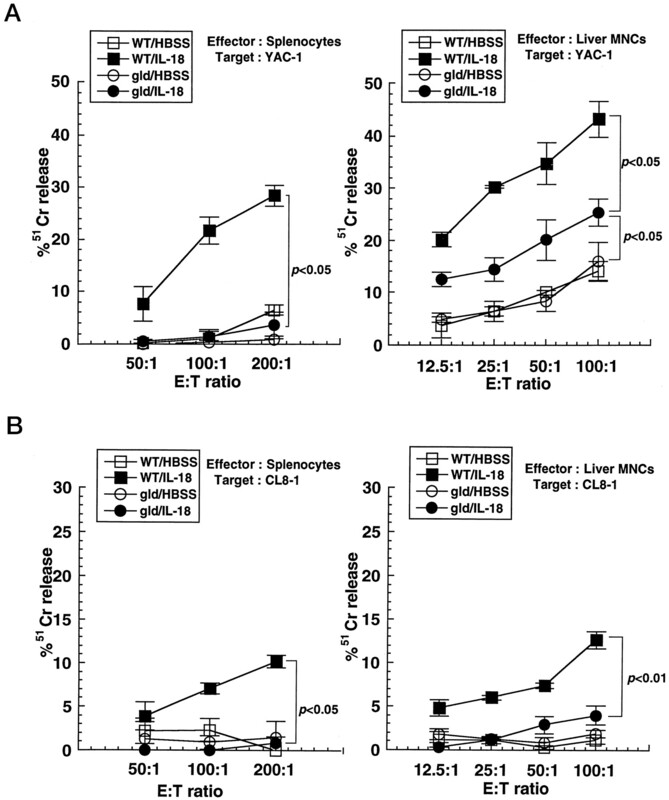 On the other hand, rIL-12 administration augments the in vitro cytotoxicity of splenic and hepatic MNCs against YAC-1 and CL8-1 cells in both wt (wt/HBSS vs wt/IL-12, p < 0.05 (all points) in both splenic and hepatic MNCs) and gld mice (gld//HBSS vs gld/IL-12, p < 0.01 (all points) in splenic MNCs and p < 0.05 (all points) in hepatic MNCs) (Fig. 3⇓ A and B). Furthermore, rIL-12 administration augmented the cytotoxic activity of hepatic MNCs against Fas-negative target cells (L5178Y), whereas rIL-18 administration did not (data not shown). The cytotoxicity of the splenic and hepatic MNCs by IL-18 administration was significantly reduced in FasL-deficient gld mice. C57BL/6 wt and gld mice were injected with HBSS or 1 μg of rIL-18 on day −2 and day −1, and the splenic and hepatic MNCs were harvested from the mice. Harvested cells were tested for their ability to lyse YAC-1 and CL8-1 targets. MNCs from two mice per treatment group were assayed at the indicated E:T ratios. Bars represent mean ± SD. P numbers were indicated when a statistically significant difference was observed at all the points tested in the group. Administration of rIL-12 augmented the in vitro cytotoxicity of the splenic and hepatic MNCs in FasL-deficient gld mice. C57BL/6 wt and gld mice were injected with HBSS or 0.5 μg of rIL-12 on day −2 and day −1, and the splenic and hepatic MNCs were harvested from the mice. Harvested cells were tested for their ability to lyse YAC-1 and CL8-1 targets. MNCs from two mice per treatment group were assayed at the indicated E:T ratios. Bars represent mean ± SD. P numbers were indicated when a statistically significant difference was observed at all the points tested in the group. IL-12 enhances the cytotoxicity of NK cells (20), NK1+ T cells (15, 16, 21, 22), and CD8+ CTL (23). Recently, it has been reported that the induction of perforin synthesis and subsequent release may be responsible for the IL-12-induced cytotoxic activity of NK1+ T cells (15, 16). To examine the role of perforin-mediated cytotoxicity, we tested the in vitro cytotoxicity of hepatic MNCs against YAC-1 target cells following rIL-12 or rIL-18 administration in C57BL/6 wt or perforin-deficient mice. Although the enhancement of cytotoxic activity induced by rIL-12 administration to wt mice (wt/HBSS vs wt/IL-12, p < 0.05 (all points)) was completely absent in perforin-deficient mice (PKO/HBSS vs PKO/IL-12, p > 0.05 (all points); wt/IL-12 vs PKO/IL-12, p < 0.05 (all points)), that induced by rIL-18 administration (wt/HBSS vs wt/IL-18, p < 0.01 (all points)) was still detectable but significantly reduced (PKO/HBSS vs PKO/IL-18, p < 0.05 (all points); wt/IL-18 vs PKO/IL-18, p < 0.05 (all points)) (Fig. 4⇓). These results suggest that in vitro cytotoxicity augmented by rIL-12, but not rIL-18, is mediated almost totally by the perforin pathway. Administration of rIL-18, but not rIL-12, to perforin-deficient mice significantly enhanced the in vitro cytotoxicity of the hepatic MNCs. C57BL/6 wt and perforin-deficient mice were injected with HBSS or 1 μg of IL-18 (A), HBSS, or 0.5 μg of IL-12 (B) on day −2 and day −1, and the hepatic MNCs were harvested from these animals. Harvested cells were tested for their ability to lyse NK-sensitive YAC-1 target. MNCs from two mice per treatment group were assayed at the indicated E:T ratios. Bars represent mean ± SD. P numbers were indicated when a statistically significant difference was observed at all the points tested in the group. To determine whether IL-18 up-regulates FasL expression in splenocytes, mRNA was analyzed by RT-PCR. Splenocytes were harvested from C57BL/6 wt mice or SCID/SCID mice (SCID) following administration of 1 μg of rIL-18 inoculation for two days without further cell separation. FasL gene expression could not be detected in splenocytes of wt mice following rIL-18 administration by RT-PCR perhaps because of the limited sensitivity of our method. To examine IL-18-induced up-regulation of FasL expression specifically in NK cells avoiding the influence of B and T cells in bulk splenocyte preparation, splenocytes were harvested from SCID mice who have a relatively higher proportion of NK cells in the spleen (24). As shown in Fig. 5⇓, the expression of FasL mRNA in SCID mouse splenocytes was augmented by rIL-18, suggesting that IL-18 induces up-regulation of FasL expression on NK cells. Enhanced FasL mRNA expression in murine splenocytes following rIL-18 administration. Mice were treated with HBSS or 1 μg of IL-18 for 2 days, and the splenocytes were harvested. Total cellular RNA was extracted from whole MNCs. Two hundred nanograms of RNA-equivalent cDNA was used as a template for PCR. Shown are β-actin (22 PCR cycles) and FasL (22 PCR cycles) mRNA levels in splenocytes from one representative experiment repeated three times. To determine whether the Fas Ag expressed on CL8-1 cells is functional, the anti-Fas agonistic Ab (Jo2) was incubated with CL8-1 cells in vitro, and the intensity of PI staining was measured to examine the extent of Fas-induced cell death. Treatment with the anti-Fas Ab indeed induced death of CL8-1 cells, confirming that CL8-1 tumor cells are susceptible to Fas-mediated events (Fig. 6⇓ A and B). Interestingly, this Fas-mediated cytotoxicity of CL8-1 cells was up-regulated by incubation with IFN-γ (Fig. 6⇓, C and D). This was also confirmed by staining with the anti-Fas Ab, that IFN-γ stimulation could up-regulate Fas expression on CL8-1 cells (Fig. 6⇓E). These results demonstrated that Fas-mediated cytotoxicity could be significantly enhanced through up-regulation of Fas expression on target cells by IFN-γ, which in turn is induced by IL-18 stimulation. 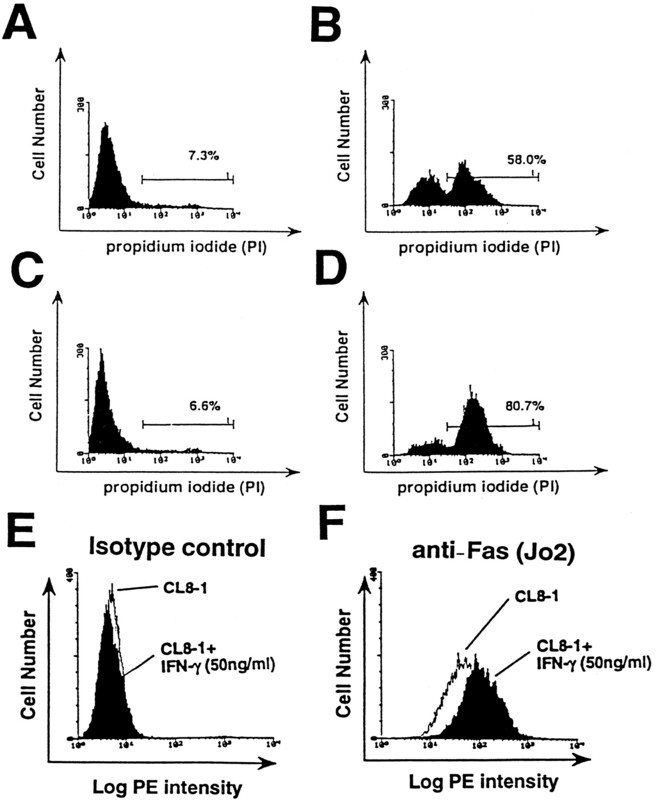 Death of CL8-1 cells was induced by the agonistic anti-Fas Ab (Jo2) and further enhanced by incubation with IFN-γ. CL8-1 cells (1 × 106) were seeded in 12-well plates and treated with an agonistic Ab (Jo2, 1 μg/ml) against the Fas Ag with and without IFN-γ incubation (50 ng/ml). After Ab incubation for 30 h at 37°C, the percentage of dead cells was determined by flow cytometry after PI staining. A, Isotype control (Hamster IgG) stimulation; (B) anti-Fas Ab (Jo2, 1 μg/ml) stimulation; (C) isotype control (hamster IgG) and IFN-γ (50 ng/ml) incubation; (D) anti-Fas Ab (Jo2, 1 μg/ml) and IFN-γ (50 ng/ml) incubation; (E) CL8-1 cells were stained with PE-conjugated control hamster IgG (open histogram). CL8-1 cells were stained with PE-conjugated control hamster IgG after incubation with IFN-γ (50 ng/ml) for 30 h (hatched histogram). F, Expression of Fas Ag on CL8-1 cells. CL8-1 cells were stained with PE-conjugated anti-Fas Ab (open histogram). CL8-1 cells were stained with PE-conjugated anti-Fas Ab after incubation with IFN-γ (50 ng/ml) for 30 h (hatched histogram). We have demonstrated here that the in vivo antitumor effects of rIL-18 administration are completely absent in FasL-deficient gld mice, but not in Fas-deficient lpr mice. The in vitro NK-like activity against YAC-1 and CL8-1 target cells was remarkably suppressed in gld mice as well (Fig. 2⇑). To evaluate the role of perforin pathways in the IL-18-induced antitumor effects, we evaluated the cytolytic activity in perforin gene-disrupted mice. Although IL-12-induced cytotoxicity was completely abrogated in this perforin-deficient system, IL-18- induced cytotoxicity significantly remained (Fig. 4⇑). Furthermore, RT-PCR analysis revealed that rIL-18 administration up-regulated FasL expression on splenic NK cells (Fig. 5⇑). We also demonstrated that Fas-mediated killing of target cells could be augmented by incubation with IFN-γ, which can be induced by IL-18 (Fig. 6⇑). Since IL-18 is known to share several biological functions with IL-12, including the induction of IFN-γ production and enhancement of NK-like lytic activity, we contrasted the antitumor mechanism mediated by rIL-12 with that of rIL-18. We showed here that rIL-12 administration greatly suppressed the in vivo growth of CL8-1 cells, even in gld mice in which rIL-18 virtually had no antitumor effects (Fig. 1⇑B). 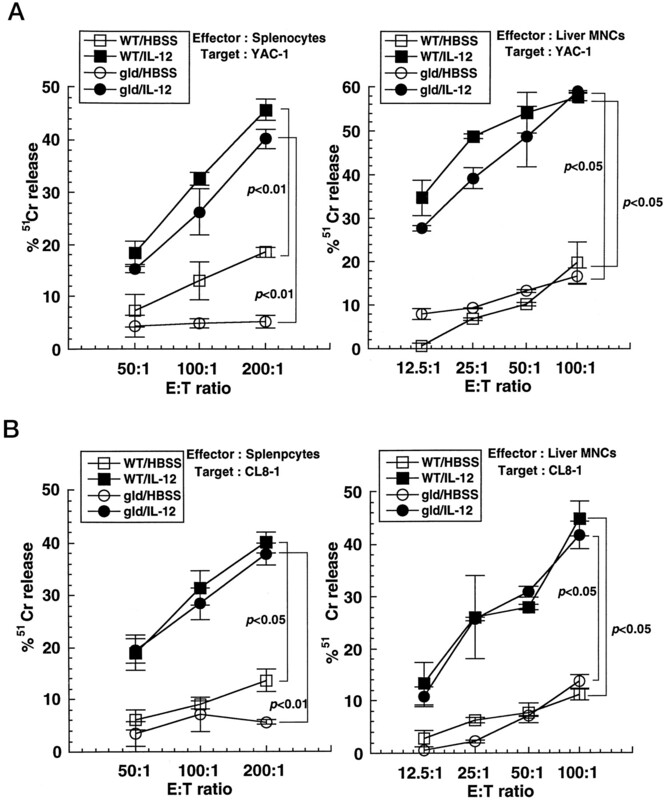 In addition, cytolytic assay revealed that rIL-12 administration failed to enhance the in vitro cytotoxicity of hepatic MNCs harvested from perforin-deficient mice (Fig. 3⇑). These results indicate that IL-12 antitumor effects are mainly mediated through perforin pathways, consistent with other recent reports that suggest that the induction of perforin may be necessary for the IL-12-enhanced cytolytic activity of lymphocytes (15, 16). In contrast with IL-12, our results indicate that the antitumor effects of IL-18 are mediated primarily through the Fas-FasL pathway. Although both our in vitro and in vivo results consistently reveal the importance of the Fas-FasL pathway in IL-18 antitumor effects, the role of perforin in rIL-18-mediated effects differs when evaluated in vitro and in vivo. Although the in vivo studies using gld mice suggest a minor involvement of perforin-mediated killing in IL-18 antitumor effects, cytotoxicity was significantly reduced in assays using lymphoid cells harvested from perforin gene-disrupted mice. This is consistent with recent reports noting perforin-dependent cytotoxicity of liver NK1+ T cells, which was augmented in vitro by IL-18 administration (25). We believe that these findings may be due to IFN-γ effects in vivo on target cells induced by IL-18 administration but were not observed in short-term in vitro cytotoxic assays. As previously reported in other tumor lines (26, 27), IFN-γ treatment augmented agonistic anti-Fas Ab-induced death of CL8-1 cells in our studies (Fig. 6⇑). rIL-18 administration induces Fas-mediated apoptosis both by up-regulating FasL expression on NK cells and IFN-γ-enhanced Fas susceptibility of target cells. There are other possible explanations for this difference between the in vivo and in vitro results. Conventional CTLs may also participate in Fas-mediated apoptosis in vivo. The in vitro cytotoxic assay used in our studies is dependent on the NK activity of lymphoid cells but is not due to CTL activity. Our recent studies evaluating gene-modified tumor cells to deliver IL-18 demonstrated that CD8+ T cells are involved in IL-18 antitumor effects in animals bearing established tumor (13). Thus, it is conceivable that a subset of T cells, possibly sensitive to anti- asialo GM1 Ab treatment, may be responsible for the difference observed in vitro and in vivo. The antitumor effect associated with administration of rIL-18, but not rIL-12, is mediated by triggering Fas-dependent tumor apoptosis. The experiments performed here were primarily designed to study the role of rIL-18 in innate, but not adaptive, immune effector mechanisms. Although IL-18 does not directly drive Th1 development in contrast with IL-12 (6), our previous results (12) suggest that rIL-18 could indeed promote Th1 activity. Following rIL-18 administration and subsequent tumor cell apoptosis, enhanced Ag presentation to dendritic cells may increase and promote CTL generation. Apoptotic tumor cell death serves as source of Ag reported to be efficiently acquired by dendritic cells to promote class I-mediated CTL induction (28). Some of the rIL-18 antitumor effects appear to be mediated by nonimmunologic mechanisms, including antiangiogenesis. Coughlin et al. have recently shown that the antitumor effects of IL-18 expressed locally with IL-12 are mainly mediated by the antiangiogenic effects of chemokines induced by IFN-γ (29). Detailed studies on this issue are currently in progress in our laboratory using both rIL-18 administration and IL-18 gene therapy. To date, our results are consistent with the observation that IL-18 has antitumor effects mediated by distinct mechanism when compared with that of IL-12 administration. We thank Dr. Quan Cai for generously providing the primer for murine FasL. We thank Drs. Toru Kitagawa, Yasuhiko Nishioka, Muneo Numasaki, Takuya Takayama, Motohiro Hirao, Fumiaki Tanaka, Hideho Okada, Kazumasa Hiroishi, Hiromune Shimamura, Andrea Gambotto, and Levent Balkir for their valuable assistance and suggestions. We are also grateful to Ms. Loraine R. McKenzie and Susan F. Schoonover for their excellent technical assistance. ↵1 This work was supported by Grant POI CA59371 (to M.T.L., P.D.R., and H.T.) and by a Career Development Award of the American Society of Clinical Oncology (to H.T.). ↵2 Current address: Department of Medicine III, Osaka University Medical School, Osaka, Japan. ↵4 Abbreviations used in this paper: FasL, Fas ligand; gld, generalized lymphoproliferative disease gene; lpr, lymphoproliferation gene; wt, wild type; MNC, mononuclear cells; i.d., intradermally; PI, propidium iodide; PKO, perforin knockout. Osaki, T., W. Hashimoto, A. Gambotto, H. Okamura, P. D. Robbins, M. Kurimoto, M. T. Lotze, and H. Tahara. 1999. 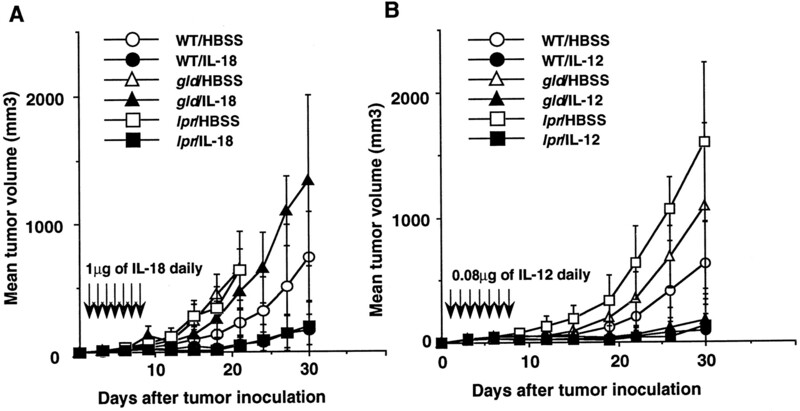 Potent anti-tumor effects mediated by local expression of the mature form of the interferon-γ inducing factor, interleukin-18 (IL-18). Gene Ther. In press.